Anyone watching? They revamped the course, using the old parcours of 'De Ronde' with de Muur at the very end. But yeah the proper stuff kicks off today, sadly not watching i'm afraid. Playing Flamme Rouge has made me almost want to watch some cycling. Are there any good documentaries for a noob like me? Looks like it's time to start making use of that Europlayer subscription. Yeah, fair enough but those are races where you catch a headline about who won and who shows good form after the winter break. Not really on par with the classics that are moving off now, which I'll watch live for the last 100k of I can or where I'll at least try to catch the last 40, 30, 20 if there's stuff to do that's preventing me from sitting on the sofa all afternoon. I'm not sure how the riders treat those races, as a genuine race that they want to add to their victory list or as a dress rehearsal and test for the first part of the European season. Tonka, a day in hell is a good one, especially if you have the afternoon of April 8 free to watch this year's edition. Dammit, missed the Omloop, KBK is on now though. @Salaman for sure man! I was just messing with you haha. To be honest aside from the tours i do prefer the one day races as well. Just the build up, the atmosphere, adrenaline, the action. It's something special. And it is kind of nice , on the pro level at least, it is kept to a select group of races. I like the long form races for the story and the mountain stages, but i think my favourite cycling memories are watching Cancellara or Boonen launch attacks or chase down the breakaway and bridge across. I used to religiously watch every mile of the tours i could, but even now unless their is a queen stage i find myself getting too easily distracted. 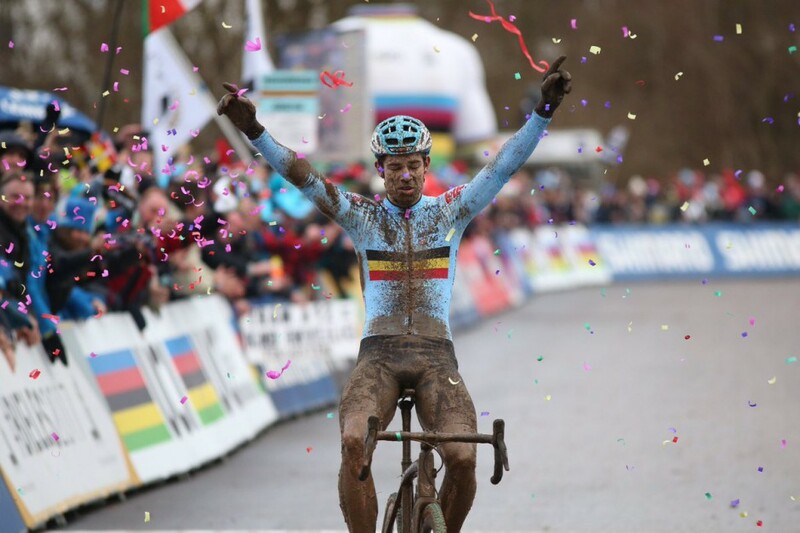 Wout Von Aert, cyclo cross WC displaying himself well. I watched A Sunday in Hell on YouTube and it was really cool. There's a bunch of other oldish cycling documentaries on the as well. I'm quite surprised how well Van Aert seems to have made the switch, after a full cyclocross session no less. Before De Omloop and today's start be could just say "don't expect too much of me. Just testing how I do at this road racing malarkey" but the way he's going, he won't be able to shift expectation away from himself before the next few classics. Impressive race by Tiesj today though. Chased for ages, managed the jump to the front and then went at it alone. For his first career win, it was definitely a good one. I just saw some fan made footage of Van Aert shortly before the finish (top of the very last climb). It's a good thing that climb wasn't 100 meters longer. He’s just completely spent I think, used to red lining for an hour as opposed to near threshold for longer, great footage. I think he cramped up. He probably pushed himself past the limit and then a bit further. Well that was a bit silly Mark. Lol thought Nibali was a little early there. Good finish. Hope Cav is alright though. He’ll have lost a fair bit of skin if nothing else. The shot cut away too quick but it looked like he was ridden over too possibly. Man, nasty crash for Cav. He's not having much luck of late. Good news is that cav as no broken bones except a fracture to the same rib he damaged at TA (not sure if it a new one or just pain in the same rib) A few lacerations and maybe some ankle ligament damage. Today's stage of the Volta is great if you can catch the highlights. Proper old school racing. E3 today, an unexpectedly exciting race! Quick Step in particular impressed with their team tactics (with a bit of luck because they were sorted in a big crash). I'm already in position on the sofa to watch the first kilometers of the Tour of Flanders live. No breakaway yet, already a crash for Sep Van Marcke. The guy really is disproportionately unlucky. 11:17, is it to early for a beer yet? I wasn't sure he was going to catch the breakaway riders. Then he caught them, loaded them and steamed on to victory. Well done. Another Quick Step win.